South Africa’s Constitution grants every citizen the right to have access to water. Notable success has been achieved in providing all South Africans with access to water and sanitation since the advent of the democratic dispensation in 1994. However, water availability remains a concern. The droughts that have affected South Africa over the past few years have had a major economic impact on the country. 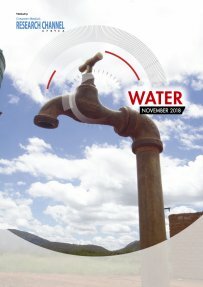 Besides frequent droughts, which are driven by climatic variation, South Africa’s water challenges are also attributable to inadequate water infrastructure maintenance and investment, deteriorating water quality, a shortage of water engineers in the country and increasing demand that is attributable to population growth and urbanisation. The Department of Water and Sanitation forecasts that the situation is approaching crisis proportions, warning that, if demand continues to grow at current rates, the deficit between supply and demand could range from 2.70‑billion cubic metres a year to 3.80‑billion cubic metres a year by 2030. This edition of Creamer Media’s Water Report considers the aforementioned issues, as well as that of nonrevenue water, water quality, water tariffs and water regulation and planning in South Africa, besides others. The report also gives an overview of the state of global water affairs. This report is a summary of information published in Engineering News and Mining Weekly, as well as of information available in the public domain over the past 12 months. The report does not purport to provide analysis of market trends. Published on: 16 November 2018.